Pleckstrin homology domain (PH domain) is a protein domain of approximately 120 amino acids that occurs in a wide range of proteins involved in intracellular signaling or as constituents of the cytoskeleton. This domain can bind phosphatidylinositol lipids within biological membranes (such as phosphatidylinositol (3,4,5)-trisphosphate and phosphatidylinositol (4,5)-bisphosphate), and proteins such as the βγ-subunits of heterotrimeric G proteins, and protein kinase C. Through these interactions, PH domains play a role in recruiting proteins to different membranes, thus targeting them to appropriate cellular compartments or enabling them to interact with other components of the signal transduction pathways. Individual PH domains possess specificities for phosphoinositides phosphorylated at different sites within the inositol ring, e.g., some bind phosphatidylinositol (4,5)-bisphosphate but not phosphatidylinositol (3,4,5)-trisphosphate or phosphatidylinositol (3,4)-bisphosphate, while others may possess the requisite affinity. This is important because it makes the recruitment of different PH domain containing proteins sensitive to the activities of enzymes that either phosphorylate or dephosphorylate these sites on the inositol ring, such as phosphoinositide 3-kinase or PTEN, respectively. Thus, such enzymes exert a part of their effect on cell function by modulating the localization of downstream signaling proteins that possess PH domains that are capable of binding their phospholipid products. The 3D structure of several PH domains has been determined. All known cases have a common structure consisting of two perpendicular anti-parallel beta sheets, followed by a C-terminal amphipathic helix. The loops connecting the beta-strands differ greatly in length, making the PH domain relatively difficult to detect while providing the source of the domain's specificity. The only conserved residue among PH domains is a single tryptophan located within the alpha helix that serves to nucleate the core of the domain. Pleckstrin, the protein where this domain was first detected, is the major substrate of protein kinase C in platelets. Pleckstrin is one of the rare proteins to contain two PH domains. Regulators of small G-proteins like guanine nucleotide releasing factor GNRP (Ras-GRF) (which contains 2 PH domains), guanine nucleotide exchange proteins like vav, dbl, SoS and S. cerevisiae CDC24, GTPase activating proteins like rasGAP and BEM2/IPL2, and the human break point cluster protein bcr. Cytoskeletal proteins such as dynamin (see InterPro: IPR001401), Caenorhabditis elegans kinesin-like protein unc-104 (see InterPro: IPR001752), spectrin beta-chain, syntrophin (2 PH domains), and S. cerevisiae nuclear migration protein NUM1. Mammalian phosphatidylinositol-specific phospholipase C (PI-PLC) (see InterPro: IPR000909) isoforms gamma and delta. Isoform gamma contains two PH domains, the second one is split into two parts separated by about 400 residues. Oxysterol-binding proteins OSBP, S. cerevisiae OSH1 and YHR073w. Ceramide kinase, a lipid kinase that phosphorylates ceramides to ceramide-1-phosphate. The unrelated FYVE domain binds Phosphatidylinositol 3-phosphate and has been found in over 60 proteins. The GRAM domain is a structurally related protein domain. ^ Mayer BJ, Ren R, Clark KL, Baltimore D (May 1993). "A putative modular domain present in diverse signaling proteins". Cell. 73 (4): 629–30. doi:10.1016/0092-8674(93)90244-K. PMID 8500161. ^ Haslam RJ, Koide HB, Hemmings BA (May 1993). "Pleckstrin domain homology". Nature. 363 (6427): 309–10. doi:10.1038/363309b0. PMID 8497315. ^ Musacchio A, Gibson T, Rice P, Thompson J, Saraste M (September 1993). "The PH domain: a common piece in the structural patchwork of signalling proteins". Trends in Biochemical Sciences. 18 (9): 343–8. doi:10.1016/0968-0004(93)90071-T. PMID 8236453. ^ Gibson TJ, Hyvönen M, Musacchio A, Saraste M, Birney E (September 1994). "PH domain: the first anniversary". Trends in Biochemical Sciences. 19 (9): 349–53. doi:10.1016/0968-0004(94)90108-2. PMID 7985225. ^ Pawson T (February 1995). "Protein modules and signalling networks". Nature. 373 (6515): 573–80. doi:10.1038/373573a0. PMID 7531822. ^ Ingley E, Hemmings BA (December 1994). "Pleckstrin homology (PH) domains in signal transduction". Journal of Cellular Biochemistry. 56 (4): 436–43. doi:10.1002/jcb.240560403. PMID 7890802. ^ Saraste M, Hyvönen M (June 1995). "Pleckstrin homology domains: a fact file". Current Opinion in Structural Biology. 5 (3): 403–8. doi:10.1016/0959-440X(95)80104-9. PMID 7583640. ^ Wang DS, Shaw G (December 1995). "The association of the C-terminal region of beta I sigma II spectrin to brain membranes is mediated by a PH domain, does not require membrane proteins, and coincides with a inositol-1,4,5 triphosphate binding site". Biochemical and Biophysical Research Communications. 217 (2): 608–15. doi:10.1006/bbrc.1995.2818. PMID 7503742. ^ Wang DS, Shaw R, Winkelmann JC, Shaw G (August 1994). "Binding of PH domains of beta-adrenergic receptor kinase and beta-spectrin to WD40/beta-transducin repeat containing regions of the beta-subunit of trimeric G-proteins". Biochemical and Biophysical Research Communications. 203 (1): 29–35. doi:10.1006/bbrc.1994.2144. PMID 8074669. ^ Yao L, Kawakami Y, Kawakami T (September 1994). "The pleckstrin homology domain of Bruton tyrosine kinase interacts with protein kinase C". Proceedings of the National Academy of Sciences of the United States of America. 91 (19): 9175–9. doi:10.1073/pnas.91.19.9175. PMC 44770  . PMID 7522330. ^ Riddihough G (November 1994). "More meanders and sandwiches". Nature Structural Biology. 1 (11): 755–7. doi:10.1038/nsb1194-755. PMID 7634082. ^ Yu JW, Mendrola JM, Audhya A, Singh S, Keleti D, DeWald DB, Murray D, Emr SD, Lemmon MA (March 2004). "Genome-wide analysis of membrane targeting by S. cerevisiae pleckstrin homology domains". Molecular Cell. 13 (5): 677–88. doi:10.1016/S1097-2765(04)00083-8. PMID 15023338. ^ Sugiura M, Kono K, Liu H, Shimizugawa T, Minekura H, Spiegel S, Kohama T (June 2002). "Ceramide kinase, a novel lipid kinase. Molecular cloning and functional characterization". The Journal of Biological Chemistry. 277 (26): 23294–300. doi:10.1074/jbc.M201535200. PMID 11956206. Pleckstrin homology (PH) domains are small modular domains that occur in a large variety of proteins. 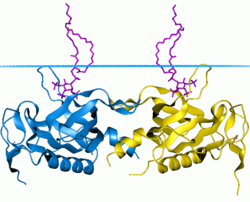 The domains can bind phosphatidylinositol within biological membranes and proteins such as the beta/gamma subunits of heterotrimeric G proteins [PUBMED:8074669] and protein kinase C [PUBMED:7522330]. Through these interactions, PH domains play a role in recruiting proteins to different membranes, thus targeting them to appropriate cellular compartments or enabling them to interact with other components of the signal transduction pathways. The 3D structure of several PH domains has been determined [PUBMED:7634082]. All known cases have a common structure consisting of two perpendicular anti-parallel beta sheets, followed by a C-terminal amphipathic helix. The loops connecting the beta-strands differ greatly in length, making the PH domain relatively difficult to detect. There are no totally invariant residues within the PH domain. Cytoskeletal proteins such as dynamin (see INTERPRO), Caenorhabditis elegans kinesin-like protein unc-104 (see INTERPRO), spectrin beta-chain, syntrophin (2 PH domains) and S. cerevisiae nuclear migration protein NUM1. Mammalian phosphatidylinositol-specific phospholipase C (PI-PLC) (see INTERPRO) isoforms gamma and delta. Isoform gamma contains two PH domains, the second one is split into two parts separated by about 400 residues. Members of this clan share a PH-like fold. Many families in this clan bind to short peptide motifs in proteins and are involved in signalling. For those sequences which have a structure in the Protein DataBank, we use the mapping between UniProt, PDB and Pfam coordinate systems from the PDBe group, to allow us to map Pfam domains onto UniProt sequences and three-dimensional protein structures. The table below shows the structures on which the PH domain has been found. There are 322 instances of this domain found in the PDB. Note that there may be multiple copies of the domain in a single PDB structure, since many structures contain multiple copies of the same protein sequence.